Ema is a 13 year old girl. Ema's parents are divorced and she lives with her mother and her very ill grandfather. Her mother runs a vegetable stall at the local market and this is their only income. During the 2009 floods Ema's house and the small amount of farmland they depend upon was completely underwater. Ema enjoys attending school and her favourite subject is all subjects. When she is not at school she loves to babysit. Ema travels to school each day by bus. When she grows up, Ema wants to be a nurse. Ema works hard to pass her exams and realises that only an education will alleviate her family's financial burdens. 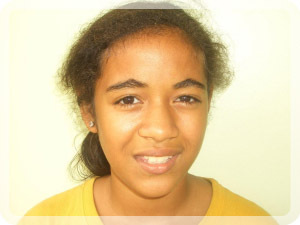 Ema is currently looking for a sponsor to continue schooling.